Before interior design became my life, what seems like a lifetime ago, I was a graphic designer. I was lucky enough to work with a variety of clever and talented people, and one of those people was the beautiful Jen Sievers. We were both working as graphic designers in a small marketing firm, but, as often happens, after the birth of our children we both changed direction slightly - me to interiors and she to fine art. Jen has been going from strength to strength since she started painting again three years ago, and I have really enjoyed seeing her become so successful doing something she loves. Her latest achievement is so exciting, as she and I have both been huge fans of the two women Jen has recently collaborated with - Julia Green and Armelle Habib. 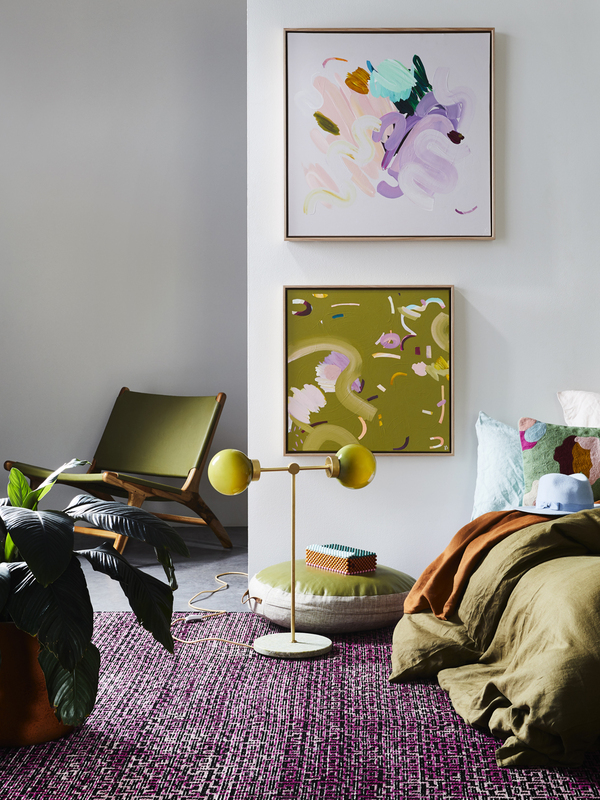 Julia Green is an incredibly talented stylist and writer and the founder of Greenhouse Interiors, an online destination for boutiques textiles, homewares, and fine art. Julia contacted Jen earlier this year interested in selling her work. Of course this was a no-brainer for Jen, who, like me, was a big fan of Julia's work. "So I painted a collection for her. It's been a whirlwind of work and excitement", Jen explains. "Being a part of her (Julia's) gang has been an impossible dream since the start. Life is full of incredible surprises!" Julia worked her magic with Jen's new collection, styling each piece in a room setting which compliments and highlights the artwork. The settings were then photographed by another of our idols, Armelle Habib, who captures them so beautifully. You can view all of Jen's latest collection here on the Greenhouse Interiors website. I'm sure you'll agree with me, the collaboration between Jen, Julia and Armelle is a winner! Briana emailed us at the end of last year when she and her husband were getting ready to relocate from Auckland to Hawke's Bay. We caught up for a coffee earlier this year once she had made the move down. With a Bachelor's degree in Spacial Design, certificates in ArchiCAD and CAD Draughting, and a working background in commercial interior design, we knew she'd be a valuable addition to our team. Being able to offer both our commercial and residential clients 3D visuals, along with documenting, draughting, and elevation drawings meant we could offer the best possible service to our clients. We got straight to work getting Briana to create 3D visuals for a clients' laundry and kitchen renovation. These are so valuable when your client wants to see their space before starting on the construction stage. It's an optional service we now offer, and it's a great tool for visualising how things fit and how different colours and materials will look. It's much better to spend a bit of time at this planning stage, tweaking the design until you're happy, than making changes at the construction stage or after installation. In this particular laundry, the doors and the room are existing, and we're getting the cabinetry made and installed by our joiner. Briana can also do the elevation drawings if necessary. Below are examples of elevation drawings Briana has done for some commercial jobs. Elevations show the fronts or sides of something, as opposed to a floor plan which shows a space from above. They're intended for use as a guide for construction, and as well as commercial projects, elevations are also great for residential kitchens, bathrooms, laundries, or anywhere that requires built-in joinery, such as bookshelves or an office. Space planning is another of Briana's fortes, as you can see from this commercial office project below. Dael and I are also adept at this, but Briana's experience in spatial design and CAD software definitely enhances our services now. So you see, the addition of Briana to our team means that Bibby + Brady can be your one stop interior design shop, cliché as that may be. Whether your project is residential or commercial, we can take it from the concept to the finished interior, project managing it along the way, and including submitting plans to Council (when necessary). You don't need to go to a number of different professionals, we can handle it all for you and take away much of the stress. We love having Briana as part of our team, and if you work with us you will definitely benefit from her too. Visit our 'Design Service' tab to find out more about working with us, and make sure you download our "work with us" pdf to learn more about our services and processes. Building or moving into a brand new home is an exciting time, and there are so many advantages over an older home. But unless you're lucky enough to have had it architecturally designed, a new house can sometimes feel a little plain, lacking in charm, or, dare I say, soulless. 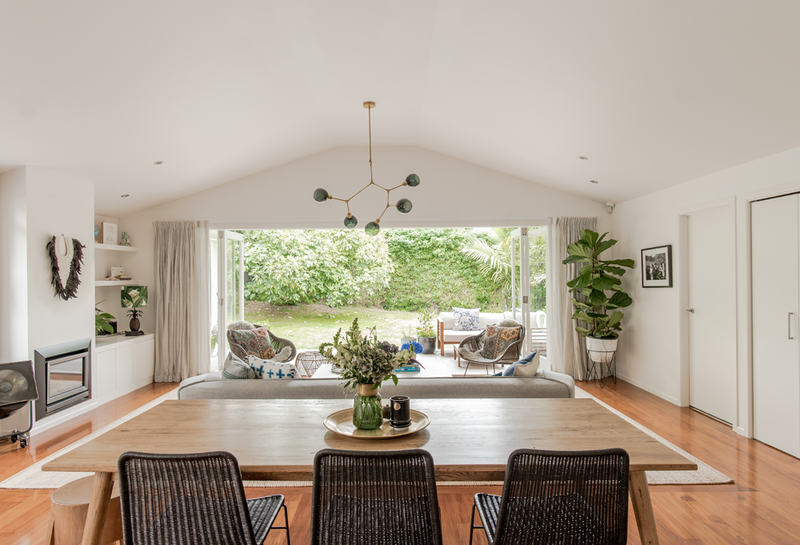 At our recent styling evening in Havelock North, I was asked if I had any tips on how to add character and interest to a newly built house, so I have put together this blog post with some of our ideas. 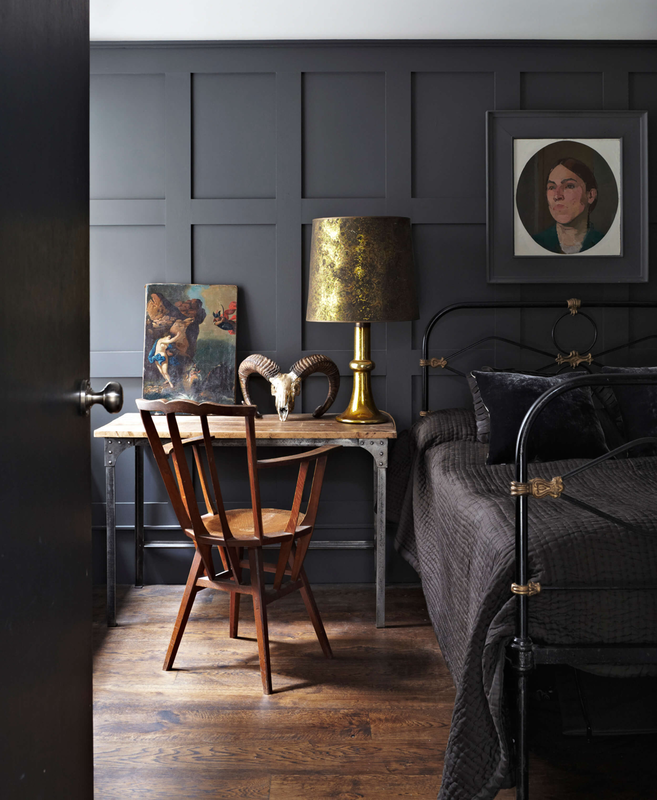 There are actually plenty of ways to inject interesting elements that will add depth and interest to your new home, one of them is to add panelling to your walls. There are a number of ways to do this and it's amazing how quickly it will elevate a room with it's subtle layer of texture. Vertical panelling is a classic look that can be made to look both traditional or contemporary depending on how it's executed. Pictured above with lovely thick skirting boards, this panelling creates a classic look. Another fun way to use it is to run it part way up the wall, top with a dado rail, and either paint or wallpaper above. The powder room below has turned what was a small, plain room into a fun, personality-filled space. The thinner panelling is a nice contrast to the door and works well in a smaller space. By square setting the panelling from the ceiling to the floor without any skirts or architraves, you create a contemporary look for your home. 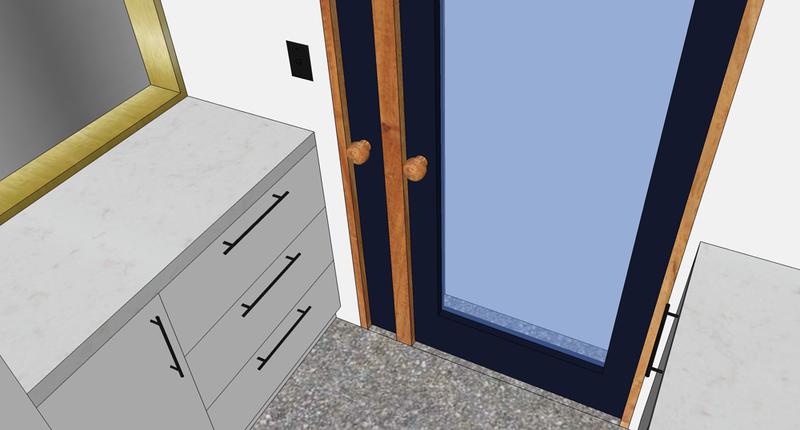 The entrance below has cleverly lined up the door and wall panelling for a clean, seamless look. This is trickier to execute, so although the first versions (above) are possible to DIY, I would recommend getting the experts to help you with this square set panelling. This look really needs to be decided on before the building stage, so talk to your builder early on in the process. We often use vertical panelling in our kitchen designs. With very little fabric or furnishings in a kitchen, it's a nice way to introduce texture. The home below uses the panelling in quite a contemporary fashion, also running it up the walls and on the door in the hallway to create a sense of continuity. Below are more examples of vertical panelling, this time using it in natural wood for a hit of warmth as well as texture. This sort of application doesn't have to be used everywhere in your house, instead use it to create a feature in key areas. Another form of wall panelling that you're probably familiar with is board and batten. It features wide boards covered by long flat strips (battens) about 5cm wide. This is one of the oldest, most traditional style of panelling and is often used on the exterior of houses. If using it on the interior of your house you can create the same look by just attaching the thin strips over a conventional wall. I love the character it adds, and it can also be used on just the lower half of your wall with paint or wallpaper above. One of my favourite wall features is box moulding. This is something you can do yourself if you're a clever 'diy-er', or have a handy man in the house. Keeping it white adds subtle texture, or paint it dark to make more of a statement. Built-in furniture pieces are not for the faint hearted, as they become a semi-permanent part of your home once installed, but they help to add that architectural detail that may be lacking in your new build. If well designed and built they will be a fantastic addition to your home and are often great for utilising otherwise unused or awkward spaces. 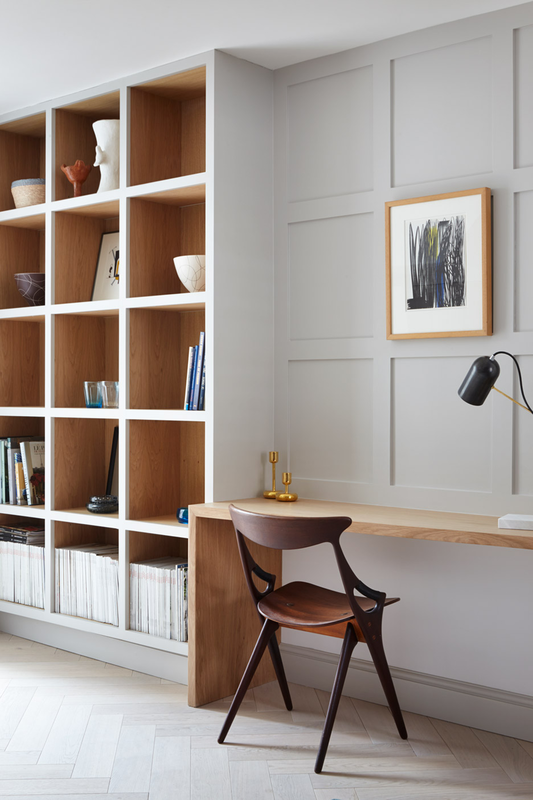 Built-in bookshelves are the most common piece we're asked for by our clients. The one below is so handy for storage and display, and they've included box moulding - win, win! When you're installing a new kitchen, the cabinets are custom made to fit. But there's nothing to stop you fitting cupboards similar to the ones below along a hallway, in an entrance, or a kids' play room for valuable extra storage. If possible, take them to the ceiling so they look like they're supposed to be there and not an after thought that has just been tacked on. The bookshelf below is our ideal living room built-in piece. Open storage for books and favourite pieces, closed storage at the bottom for things you don't want on display, and a space for the TV. This setup is also great for ensuring that the television is disguised a bit and not the centre of attention in your living room. One of our most favourite ways to add interest to, and elevate a space, is wallpaper. Powder rooms, laundries, and entrances are great spaces for wallpaper. Because you don't spend a lot of time in any of the rooms you can get really brave, go bold and wallpaper every wall. Of course, if you're open to wallpapering all four walls of your living or dining room we applaud you, but even a single wall, like the bedroom below will create a lovely feature. This grasscloth wallpaper provides beautiful texture but is otherwise quite subtle. If pattern is your thing there are a multitude of gorgeous wallpapers to choose from and we're more than happy to help you choose - patterned or plain. In any good design, contrast is a key component. When you have a brand new home, we like to add some vintage or antique pieces to give the place some depth. I love this little vintage table (below) against the crisp, new white walls. Have fun hunting on TradeMe or your local second hand shops, or if you're really lucky you may have one or two special pieces you've inherited from your parents or grandparents. 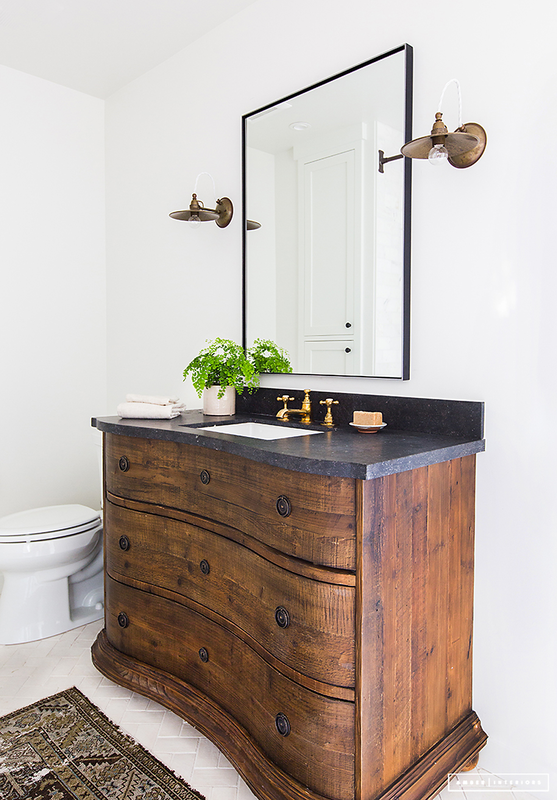 The antique dresser below has been repurposed into a vanity adding some weight and character to the brand new bathroom. 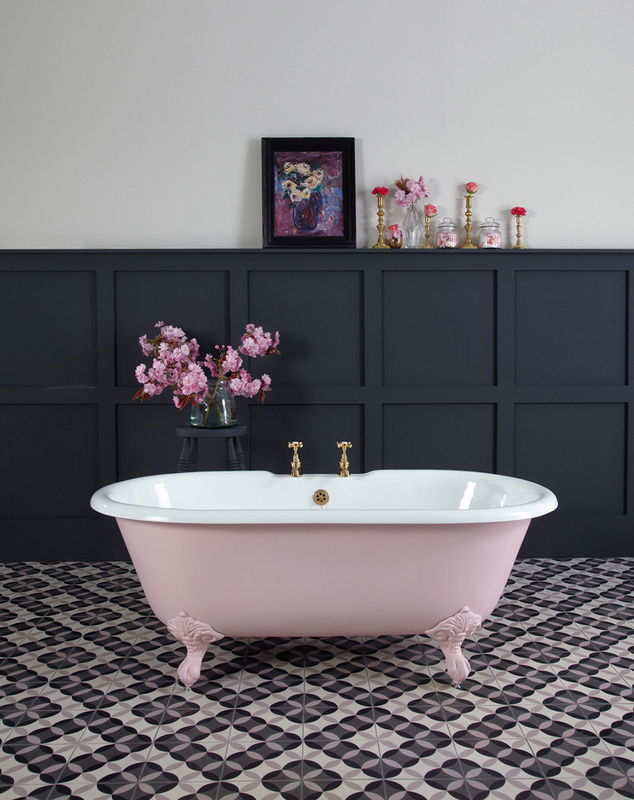 Interesting tiles in your kitchen and bathroom will instantly add character and style. I would strongly urge you to choose a beautifully tiled splash back over a coloured glass one. There are so many shiny, hard surfaces in a kitchen, and a glass splash back is just one more. Tiles can add texture and pattern, even a plain subway will be so much more interesting than flat glass. The kitchen below belongs to our clients, and although they didn't build it, the house was still very new when they bought it. Because the kitchen was so new they didn't feel the need to rip it out and start again, but they did want to breathe a bit of life into it, and stamp their own mark on it. It was as simple as replacing the handles on the bottom cabinets with a more contemporary matt black version, and removing the top ones altogether for a cleaner look. We then replaced the glass splash back with the soft green subway tiles, and added the gorgeous fish scale tiles under the breakfast bar. You can see before photos in our previous blog post. Below is the view from the above kitchen, where I can illustrate two more simple ways we added some character to the simple white interior. Other than the furniture and accessories, the two things we love about this space are the curtains and the chandelier. There were initially plain white roller blinds over the large bi-fold doors, but by replacing these with beautiful linen curtains it helped to soften the room and add texture. Fixtures like lights are a brilliant way to spice up a simple interior. We used the stunning chandelier to do just this, as well as to help zone the living room in the open plan space. A similar light was used over the breakfast bar above. 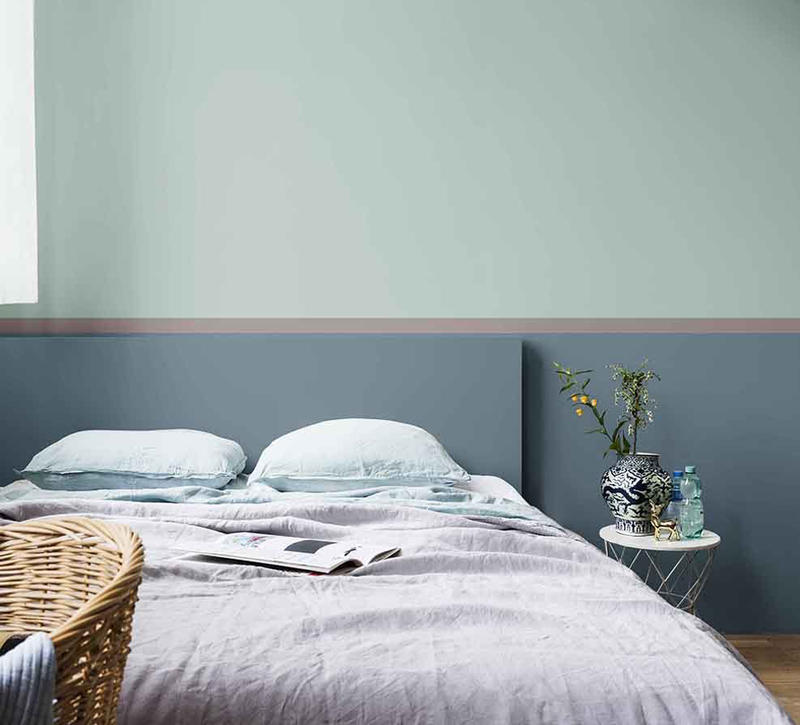 Lastly, paint is an oldie but a goodie... it is by far the quickest and most cost-effective way to change and lift a room. A simple colour can make the world of difference! The use of the multi colours below creates the illusion of an architectural feature. In conclusion, not everything above will appeal to everyone, and you obviously don't have to include each tip into your new build. But we do hope that you have gained some inspiration to take your shiny new house up to the next level. We always love your feedback, so feel free to comment below on ways you have added interest to a new build. And if there is anything you would like our advice on, let us know, it could be the next blog post we write.